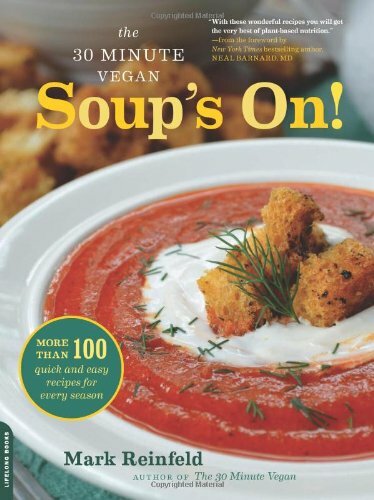 The 30 Minute Vegan Soup's On - best vegan cookbook reviews; Vegans Eat What? Help support VegansEatWhat.com – buy this book via our Amazon link! Mark Reinfeld has been actively cooking and teaching vegan approaches to eating for over 20 years. Originally trained by his grandfather who was a renowned chef in New York City, Mark went on to receive a Master’s degree in holistic nutrition. Mark’s first cookbook, Vegan World Fusion Cuisine won several National awards, including cookbook of the year. Mark’s recipes have won awards including “Recipe of the Year” in 2011. He has been honored by being chosen as the lead chef for the annual “Summerfest” convention. His company, “The Blossoming Lotus Personal Chef Service” teaches vegan cooking classes in the US and overseas. Since 2007, Mark has published six cookbooks, Soup’s On! is the latest in his “The 30 Minute Vegan” series. What I find successful about Mark’s books are that the recipes make use of his herb and spicing combinations which add so much favor and depth to the outcome. This book follows the same roadmap to success. Lots of herbs most of us would have in our pantry combining for great tastes and gloriously beautiful dishes. The book is devoid of color pictures, which might intrigue some to try the recipes, but the flavors of the soups more than make up for the lack of photographs. Many of the recipes include Mark’s personal tips, or lists of potential variations that make the book full of more recipes than you might think. Two initial chapters give recommendations for supplying your kitchen for soup making and thoughts about how to make the most of the book. I found both of these helpful. We tried a number of recipes from this book, including, Peasant Vegetable and Toasted Spice Soup, Irish Cabbage and Potato Stew, Tibetan Noodle Soup (Thenthuk), Spanish Rice and Artichoke Stew, Italian Wedding Stew with Vegan Sausage, North African Tagine with Broiled Tofu, New England Chowder, and Bavarian Asparagus Soup with Hazelnuts. I think the Bavarian Asparagus Soup is an example of a recipe that on reading it, I was not impressed. But when I made it, our guests and I were delighted by the outcome. There are more gems, like this, hidden in this book. Place a 3-quart pot over high heat. Place the mustard seeds, fennel seeds and cumin seeds in the pot and cook for 2 minutes, stirring constantly. Lower the heat to medium-high, add the vegetable stock, bay leaves, onion, celery, garlic, carrot, potato, parsnip, tomato, and fennel and cook for 15 minutes, stirring occasionally. Add the zucchini and the remaining ingredients, except the parsley, and cook for 5 minutes stirring occasionally. Add the parsley and stir well. Remove the bay leaves before serving.